A Call To Save One of Jamaica’s Treasure – The Ward Theatre! In December 1912, a beacon of light, hope and dreams was born. There in the center of Jamaica’s growing downtown metropolis was erected what would become the symbol of a country’s cultural heritage. This is the story of the magnificent Ward Theatre. The Ward Theatre... A Jamaican Treasure! Unmatched in its architectural elegance and near perfect acoustical construction, the Ward Theatre represents the consummate symbol of Jamaica’s rich cultural heritage. Step inside this rather imposing structure for five minutes and you too will find it difficult not to be transported back to a time when the Ward Theatre played host to the greatest talents from around the world; while also being the home of Jamaica’s most outstanding talent. From the world famous Sir Willard White to the luminous Louise Bennett, from the comedic genius of Gilbert and Sullivan to the ever graceful movements of our very own dance prodigy – Garth Fagan, the Ward Theatre was center stage to performing arts royalty. This great reversal of fortune has occurred in less than 50 years of existence and without so much as a civil war upon which to blame its demise. 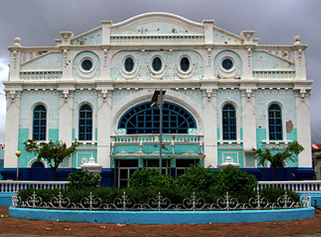 No longer a shining palace of dreams, the Ward Theatre stands now as not much more than an anecdotal reference of times past; when cultural and performing arts were the center of a young but hopeful nation quickly taking its place as the intellectual and cultural capital of the Caribbean. But while the harshness of numerous hurricanes and the indifference of those who know not of her grandeur or significance therefore resulting in an unusable state all hope is not lost. For in just a little over three years from today, we will embark on a remarkable journey. For on this day, we begin the work to fully restore this national treasure to her rightful place as one of this country’s greatest gifts and representation of what Jamaica was created to be… a grand nation that serves as a beacon of hope for what can be achieved when a nation decides to come together against all odds and reclaim its greatness. Today, we are joined by a group of determined Jamaicans who have decided that we are no longer willing to sit back and wait for someone else to do “something”. Today, we have decided that against all odds, we will restore the Ward Theatre to her former grandeur with the added elements of a world-class performing arts center. Today, the members of the Ward Theatre Foundation and the Centennial Committee, are proud to announce a Three Year Plan to raise the critical funds required to fully renovate the Ward Theatre and return to the people of Jamaica a cultural performing arts center that we can all be proud of where the world’s greatest talents will once again clammour to grace her stage. Today we ask you to join us in this celebration and share in the pride that as a nation, we have such a magnificent treasure on our shores. We are humbled to serve on the Ward Theatre’s Centennial Committee and excited about the journey ahead. We fully recognize that we cannot do this alone and so we look forward to the support that you will give towards this most incredible movement. The Ward Theatre is a Jamaican treasure unlike any other and deserves nothing less than unparalleled support from every Jamaican citizen, business and organization. In the coming months, we will unveil a number of ways in which you can lend your time, talent and treasure…no matter how small. Become a Friend of the Ward today and learn more about how you can help to Save the Ward! We thank you in advance for the wonderful support we know you will give and look forward to seeing you, your family and friends during our Centennial Celebrations over the course of the next three years. Neil Lowe, PhD Mrs. Ruby Martin, O.D., J.P.
Ward Theatre, North Parade, Kingston, Jamaica, West Indies. ← Haiti says Thank You Jamaica” for outpouring support!